Get paid with PayPal Here. With the PayPal Here app and your choice of card readers, you can get paid on-the-go or in your store - for just 2.7% per US swipe transaction. Accept major credit and debit cards in person or on-the-go, send invoices, and record cash and check transactions. Our knowledgeable team is here to help whenever you have a question, available on either your phone or via email. It’s your choice. Pay as you sell with no monthly fees, setup fees, cancelation fees or processing minimums. Fees subject to change. Learn more about fees. Sign up for PayPal Here - on your desktop or mobile. 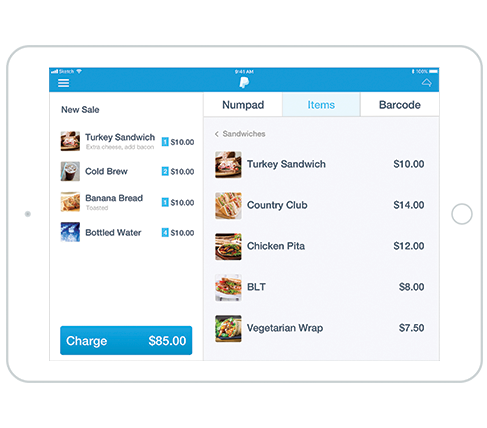 Download the PayPal Here point-of-sale app. Select and purchase a credit card reader that’s right for your business. For more information on how to get started, visit our PayPal Here Resource Center. The PayPal Here app lets you securely process credit card payments, track your sales, create invoices, and more right from your compatible smartphone or tablet. Set up your business – customize your business profile and receipts, calculate sales tax, and more. Create your product list – add your products and services, along with photos and descriptions, for fast checkout. 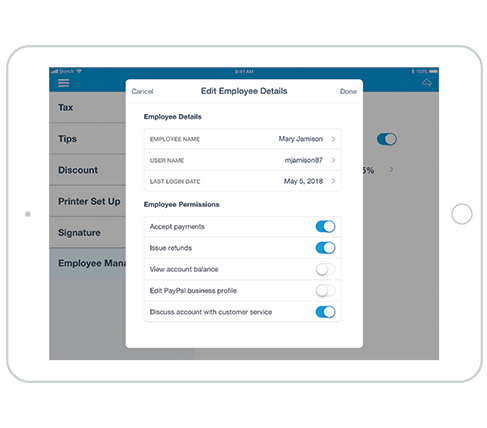 Assign roles & permissions – set up employees to securely accept payments under a single account. 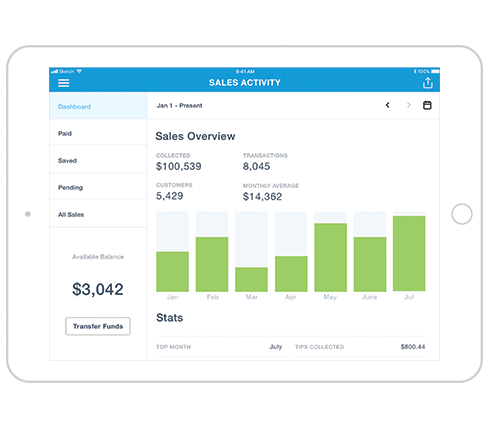 Track your sales – view your sales report by time, products, and employees right in the app. Find the card reader that's right for your business. 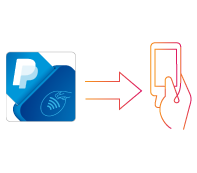 PayPal Here card readers, powered by our mobile app, make it easy to accept secure payments in your store or on-the-go. Our most popular card reader – Ideal for businesses that need to take payments on the go, in store, or in an office. Accepts magstripe cards and, for added fraud protection, chip cards. Ideal for retailers, restaurants, or other counter-based businesses with a high volume of transactions. Accepts magstripe cards, chip cards for added fraud protection, and contactless payments like Apple Pay® or Google PayTM. *Key-in transactions and sales over $500 in a 7-day period made with the Mobile Card Reader are subject to an automatic 30-day reserve where funds are held in your PayPal account to cover the high risk associated with these types of transactions. For increased protection from fraudulent transactions, we recommend using a chip card reader. All PayPal accounts are subject to policies that can lead to account restrictions in the form of holds, limitations, or reserves. Additional information about these policies can be found in the PayPal User Agreement. Apple Pay is a trademark of Apple Inc., registered in the U.S. and other countries. Google Pay is a trademark of Google LLC. Visit our store to order a credit card reader. Point-of-sale solutions for your growing business. 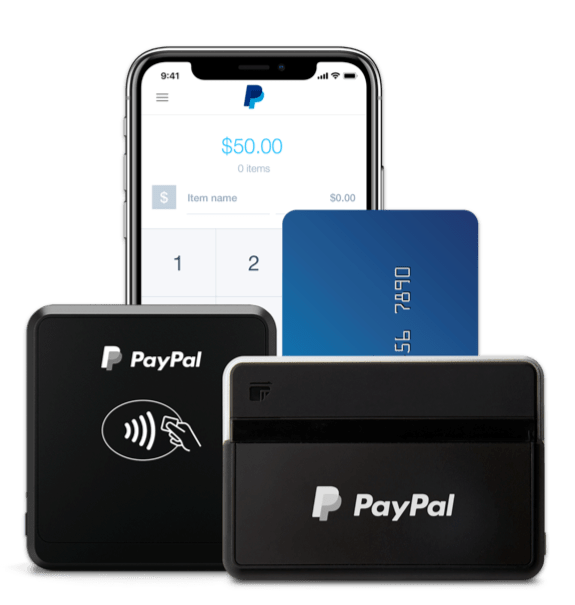 The PayPal Here app is ideal for getting paid on the go but if your business needs something more, check out the solutions offered by our partners with PayPal in-person payments integrated. 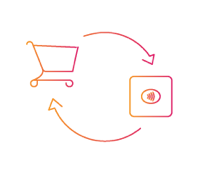 Vend helps you grow and manage your business in the cloud using one of America’s leading POS solutions for inventory management, ecommerce, and customer loyalty. Lavu’s POS system helps restaurants, bars and nightclubs, quick-serve businesses, and other hospitality industries, making it easy to manage the business and take orders. 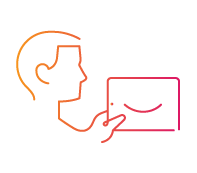 Touchpoint’s POS supports chains of any kind—coffee houses, bars, nightclubs, quick-serves, drive-thru’s—and is powerful enough to handle tens of thousands of orders per day. Learn more about our point of sale partner solutions. 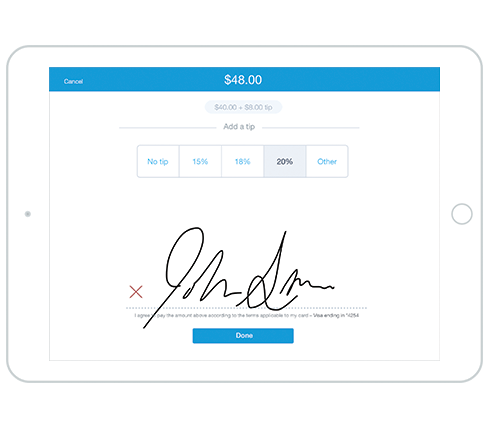 Sign up and download the app today and you can get paid wherever your business takes you. Already have a PayPal account and just need a reader? Order it here. Getting paid on the go is just the beginning. Explore our full suite of services to help grow your business. Everything you need to accept major credit and debit cards, and PayPal on your website, including a checkout experience that’s optimized across devices. We make it simple to send professional, customized invoices on your compatible device. In just a few clicks, your customers can pay you securely with credit and debit cards. Use your PayPal balance everywhere Mastercard is accepted – in store or online – plus get 1% cash back** on eligible purchases and no annual fee. *PayPal Working Capital is subject to credit approval, as determined by the lender, WebBank, Member FDIC. To apply for PayPal Working Capital, your business must have a PayPal business or premier account for at least 90 days and process between $15,000 (or for premier accounts $20,000) and $20 million within those 90 days or within any time period less than or equal to 12 months. PayPal sales include processing on PayPal Express Checkout, PayPal Payments Standard, PayPal Payments Pro, and PayPal Here. **Additional activation to receive this program’s cash back benefit is required. Transactions eligible for 1% cash back include: credit transactions which you sign for and which are processed via Mastercard; online transactions processed via Mastercard; and phone transactions processed via Mastercard. Transactions that are not eligible for cash back include, but are not limited to: purchases processed via a debit network (including PIN-less debit transactions); cash withdrawals and cash advances. Additionally, you’ll only receive cash back when your monthly earned cash back is at least $1.00 USD. Cash back earned that’s less than $1.00 USD will not be awarded and does not carry over to the next month. See the Cardholder Agreement for complete details. The PayPal Business Debit Mastercard is issued by The Bancorp Bank pursuant to license by Mastercard International Incorporated. Mastercard is a registered trademark, and the circles design is a trademark of Mastercard International Incorporated. The Bancorp Bank; Member FDIC. Card may be used everywhere Mastercard is accepted.